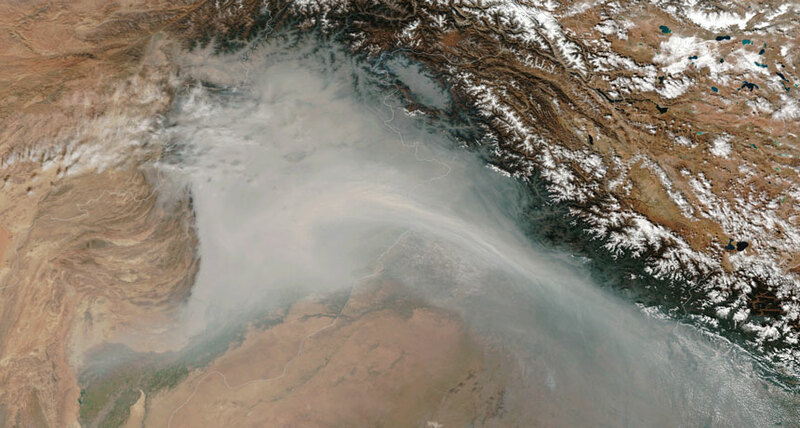 SHORTER LIVES Air pollution over India (seen in this satellite photo) shortens the average life span there by about 1.3 years. A new study calculates how much fine particulate matter pollution hurts life expectancy in 185 countries. Breathing dirty air exacts a price - specifically, months, or even years, off of life. Air pollution shaves a year off the average human life expectancy, scientists report August 22 in Environmental Science & Technology Letters. In more polluted regions of Asia and Africa, lives are shortened by 1.5 to two years on average. The study, using 2016 country data from the Global Burden of Disease project, is the first major look at country-specific mortality impacts of fine particulate matter - bits of pollution, known as PM2.5, that are smaller than 2.5 micrometers, or 30 times smaller than the width of an average human hair. And it's the first to present those impacts in terms of life expectancy, rather than death or disease rates (SN: 11/25/17, p. 5). The approach is aimed at making the risk more relatable, says Joshua Apte, an environmental scientist at the University of Texas at Austin. "Talking about mortality figures and large body counts, you see people's eyes glaze over," Apte says. "People care not just about whether you die - we all die - but also how much younger are you going to be when that happens."